Each one is packed with satisfying flavor and nutrients. If you read the New York Times bestselling memoir It Was Me All AlongÂ ($24; amazon.com), then you already know about Andie Mitchell's inspiring 135-pound weight loss journey. Her secret? Balance. AlthoughÂ she eatsÂ healthy for the most part, she doesnât completely deprive herself of the rich treats (cakes, pasta, nachos) she loves. Read on for three of herÂ easy, flavorful recipes. Preheat the oven to 350Â°F. In a medium bowl, beat the eggs. In a 10-inch ovenproof nonstick skillet, heat the oil over medium-high heat. Add the shallots, asparagus, leeks, salt, and pepper, and cook until beginning to brown, about 5 minutes. Add the spinach and cook, stirring frequently, until wilted, 1 to 2 minutes. Lower the heat to medium, add the garlic, and cook, stirring constantly, until fragrant, 30 seconds. Add the eggs and stir. Cook, without stirring, until just set on the bottom, 30 to 45 seconds. Using a plastic spatula, lift the frittata edge nearest to you and tilt the skillet gently so that the eggs run underneath the cooked bottom. Swirl the pan to evenly distribute the egg in the skillet and continue to cook for 1 minute. Lift the pan once more to repeat the process until the egg on top is no longer runny. Scatter the goat cheese on top. Bake until the top is set and the cheese begins to melt, 5 to 7 minutes. Sprinkle the basil over the top. 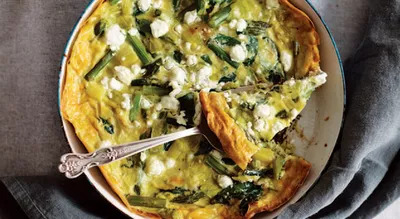 Run a spatula around the sides of the frittata and transfer it to a large serving plate. Cut into four pieces and serve warm, at room temperature, or even chilled. Preheat the oven to 350Â°F. Spread the cashews on a baking sheet and toast until golden and fragrant, about 10 minutes. Let cool slightly, then chop the cashews. In a small bowl, whisk together the broth, hoisin, soy sauce, sugar, and cornstarch. In a 12-inch nonstick skillet set over medium-high heat, heat the oil. Add the garlic and cook, stirring constantly, until fragrant, about 30 seconds. Add the chicken and cook, breaking up the meat with a spatula, until browned, 4 to 6 minutes. Add the scallions and the hoisin sauce mixture and cook, stirring frequently, until the sauce thickens slightly, about 2 minutes. Stir in the basil and cashews. 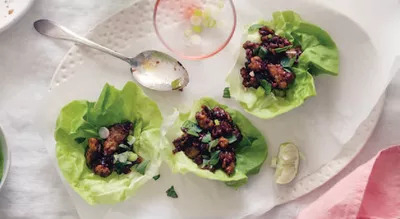 To serve, divide the lettuce leaves among 4 plates and spoon the chicken mixture into each of the leaves. In a medium saucepan set over medium-high heat, bring the farro, broth, and bay leaf to a boil. Reduce the heat to medium-low and simmer until the grains are tender but still chewy, about 30 minutes. Stir the beans into the hot grains. Add the GruyÃ¨re and Parmesan and stir until melted. Cover to keep warm. Meanwhile, in a 12-inch nonstick skillet, heat 2 tsp. of the oil over medium-high heat until very hot. Add the mushrooms and cook until browned on one side, 3 to 4 minutes, then stir and cook until browned and tender on the other side, 3 to 4 minutes more. Transfer the mushrooms to a warm plate. Add the remaining 2 tsp. of oil to the skillet along with the shallots and garlic and cook, stirring constantly, until the garlic is fragrant, about 30 seconds. Add the kale and cook, stirring frequently, until wilted, about 3 minutes. Season with the salt and pepper. 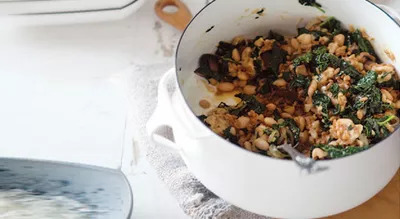 Stir the kale, mushrooms, and parsley into the farro and beans and serve immediately. Recipes reprinted from Eating in the Middle: A Mostly Wholesome Cookbook. Copyright 2016 by Andie Mitchell. Photographs copyright 2016 by Aran Goyoaga. Published by Clarkson Potter, an imprint of Penguin Random House, LLC.